SPAIN: Catalonia Leader Poised To Unilaterally Declare Independence After Violent Referendum [VIDEO] - Joe.My.God. The leader of Catalonia insisted on Monday that Sunday’s independence referendum, though marred by clashes and rejected by the Spanish government, had earned his region the right to a separate state and that he would press ahead to make the vote binding. Shortly after midnight on Sunday, the Catalan government announced that 90 percent of almost 2.3 million voters had cast ballots in favor of independence. 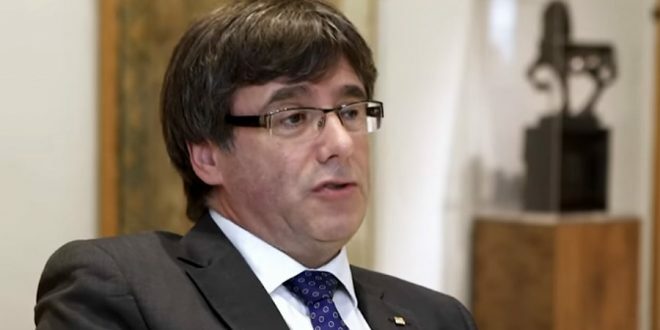 But a consensus on the vote, even among Catalans, was by no means assured, despite Mr. Puigdemont’s stated determination. The referendum’s tallies could not be independently verified; the voting registers used were based on a census whose validity is contested; and, most important, Spain’s constitutional court had ordered that the referendum be suspended. So far no country or international body has expressed any support for the Catalan government’s independence drive, so any declaration of independence is likely to be rejected, at the beginning at least. The European Union is standing solidly behind Spanish Prime Minister Mariano Rajoy and says Catalonia would be expelled from the bloc and the shared euro currency. Economically it is impossible to predict if it could survive. Catalonia has an annual gross domestic product of about 215 billion euros ($257 billion) — the largest of the Spanish regions and greater than Greece’s — but many of its goods are supplied by the Spanish state. Spain has two main options and both would be painful. The constitution’s Article 155 allows the government to suspend, totally or partially, any region’ self-government if it disobeys its constitutional obligations or attacks the general interests of Spain. Catalonia would first be warned and if it didn’t rectify, the measures decided upon would be put to the Senate for approval, a simple matter for Rajoy as his party has a majority. Possible measures could include placing the region’s police under Spanish control. If necessary, Spanish police could enforce the measures. More than 40 unions and Catalan associations called a region-wide strike for Tuesday, after a major police crackdown on a banned independence referendum. “We call all society, on employers’ organisations, business owners, unions, workers, self-employed workers, institutions and all the citizens of Catalonia to stop the ‘country’ on Tuesday, October 3,” they wrote. Pro-independence Catalans often refer to the northeastern region as a “country.” The regional government says more than 840 people received medical attention on Sunday after riot police moved in on polling stations as Catalans tried to vote in the referendum, defying a ban by Madrid.